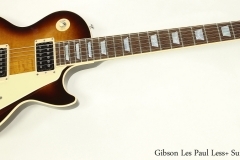 Appearing in 2015, the Gibson Les Paul Less Plus, or Less +, features a shallow, weight-relieved and contoured version of the classic Les Paul body construction. It was originally equipped with the new GForce automatic tuning gears, Zero Fret Adjustable nut, and improved TUne-O-Matic bridge with titanium saddles. For electronics, a pair of ’57 models – Classic at the neck and 57 Plus at the bridge – feed individual volume controls and master tone control. The pickups can be split via a mini-toggle. Commemmorating his 100th birthday, the headstock carries a Les Paul signature in gold, and a Less + engraved truss rod cover. 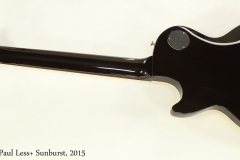 This Gibson Les Paul Less Plus dates to 2015 and was built at the Gibson plant in Nashville, Tennessee. It’s had its GForce tuners removed, as has often been the case, and they have been replaced with locking Grover Roto-Matic models. It’s in very good condition with very little wear of any kind. The original rectangular molded, brown Gibson hard shell case is included.